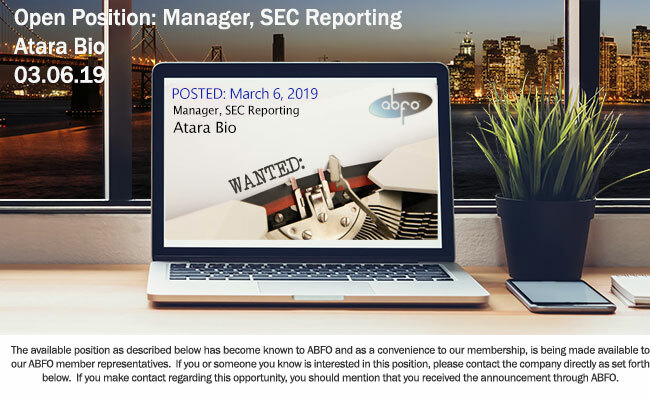 The Manager of SEC Reporting, Technical Accounting and Compliance is responsible for all SEC financial reporting activities and technical accounting analysis. This individual will frequently interact with accounting staff, IT, legal, and other stakeholders across the organization as well as external SOX consultants and external auditors. This role requires critical thinking skills, effective organizational skills, excellent written and verbal communication skills, and a strong ability to build effective relationships across the Company. This position offers the successful applicant the opportunity to leverage a strong background in external reporting, technical accounting and Sox compliance with the intensity and dynamics of a rapidly growing biotechnology company. Lead the preparation of Company’s SEC filings, including 10-Qs and 10-Ks, and ensuring appropriate XBRL tagging of related content in Active Disclosure. Gather supporting data, tie outs and preparing information for review. Ensure financial statements are presented in accordance with GAAP guidelines. Proactively identify accounting & disclosure issues, and perform related research and documentation of such issues in accounting whitepapers; propose suitable disclosures and benchmark against industry standards. Maintain relationship and work closely with External Auditors, Business Owners and Senior Management to ensure communication of critical issues in a timely manner. Coordinate/monitor/review the execution of audit procedures including those in support of management’s assessment of internal controls over financial reporting in according with the COSO Framework and Sarbanes-Oxley Act (SOX). Partner with SOX consultants in documentation of SOX Risk Assessment, Risk Matrix, Process Documents, Process Flow Charts, Testing Protocol, and Review Testing. Enjoys being ‘hands-on’ and able to work in a co-located environment. Role model for Atara Biotherapeutics’ values. Travel: Ability to travel, up to 15% travel time.